The Congregational Church was first organized in 1819, but, its first church building was not opened until 1835. The church was built by Henry F. Merry, a carpenter, who came to Sandusky from Milan. Building the church was his first contract. 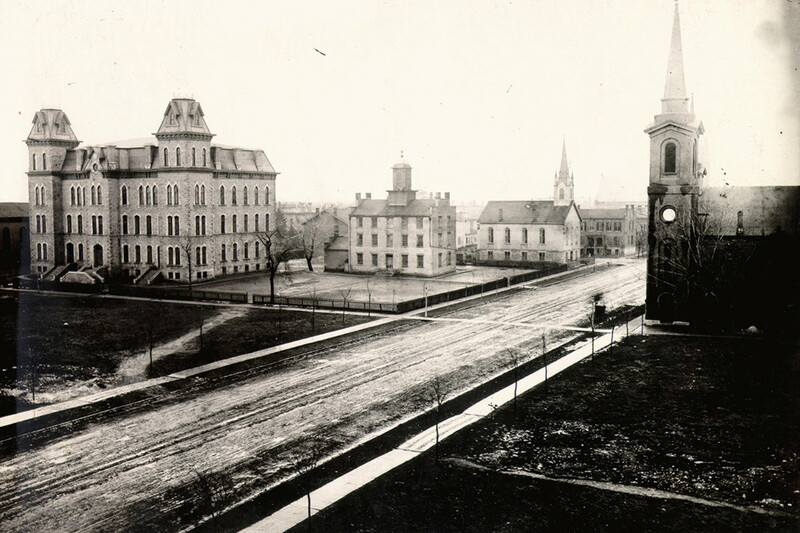 The church originally was located in Washington Square (in a corner of the property where the current Erie County Court House is located), but was razed in 1896. The church served as a social center for Sandusky. It was the site of a number of meetings dealing with slavery and temperance. For many years the members were divided on the slavery issue. In 1846, 19 members who adamantly opposed slavery decided to resign their membership and form a new church – the Second Congregational Church of Sandusky. Finally at a church meeting in August of 1847, resolutions denouncing slavery were introduced and passed unanimously by the entire congregation. The minister of the First Congregational Church in 1849 was the Rev. N.W. Fisher. Unfortunately, in 1849 a cholera epidemic swept through Sandusky and he fell victim to the disease. He is buried in Oakland Cemetery, unlike others who were buried in the Cholera Cemetery located west of the town limits. Under the leadership of Rev. Clarence Vincent, the new First Congregational Church was built just a block south of the original location at 431 Columbus Avenue. The builder of this church was George Philip Feick. In May of 1919, the First Congregational Church celebrated its centennial services. Currently known as the First Congregational United Church of Christ, this church continues to play a vital role in the spiritual life of many local residents.